Thank you to everyone who stopped by the first part of my Holiday Home Tour, I really appreciate all of you taking the time to visit! 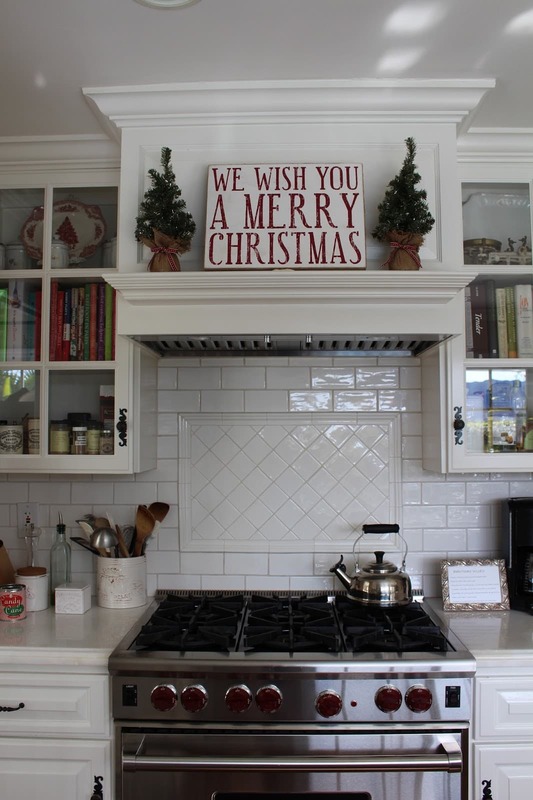 The reason I split my tour into two parts is that the two areas of my house are decorated so differently, they just didn’t seem to belong in the same post. 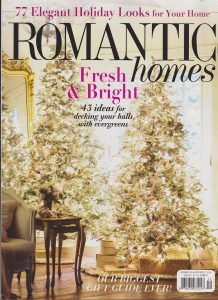 If you are a regular reader, then you know that I talked about having a mostly neutral Christmas this year here, with greens and creams dominating, which is what I did in the living and dining rooms and what you saw in the first tour. However, my family room and kitchen have red accents already, so it just made sense to go with a predominantly red and white themed Christmas in here. The red and white reads more casual and so it really works in here, I think. I’m not quite sure what I will do when I re-do the family room (you can read about my desire to change the red accents to blue in this post), but I guess I will work that out next year! So here is my Holiday Home Tour Part II – welcome! I love using natural elements at Christmas! 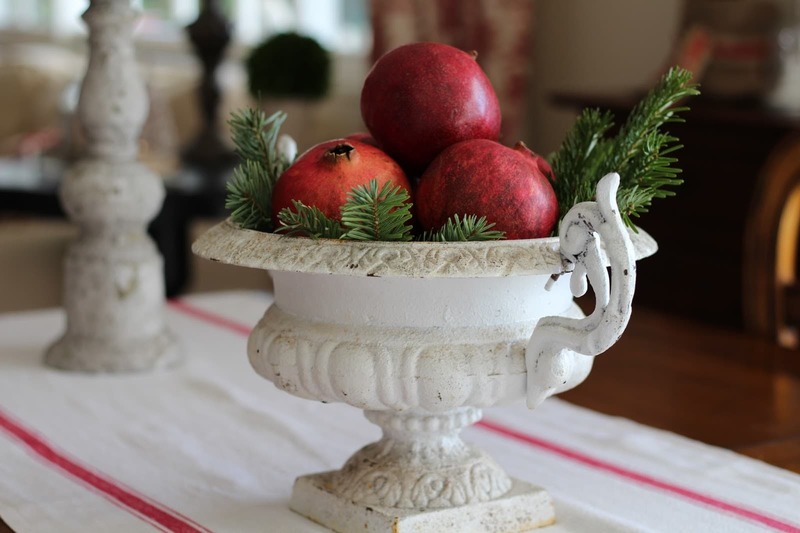 Here I used pomegranates in a vintage urn. I’m big on Advent calendars. I grew up always having one and had been using the same one I bought when I had my first child. When I saw this one this year at Home Goods, I just had to buy it! Not only does it go so well with the rest of my red and white decor, but I was finally feeling the need for a little change. 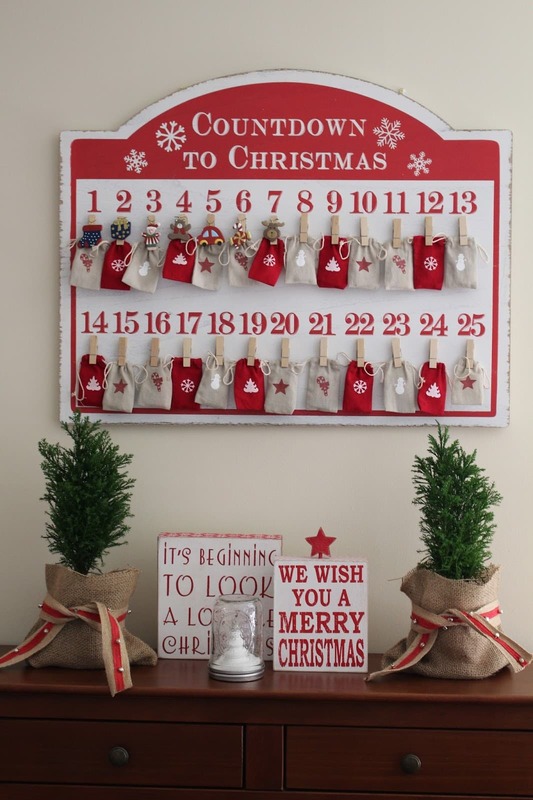 In each burlap bag I put a little piece of chocolate, but I also decided to incorporate the old Advent calendar. I took the little ornaments from that one and added them to this. Now the kids get the chocolate but they also get to hang the little ornament over that date! 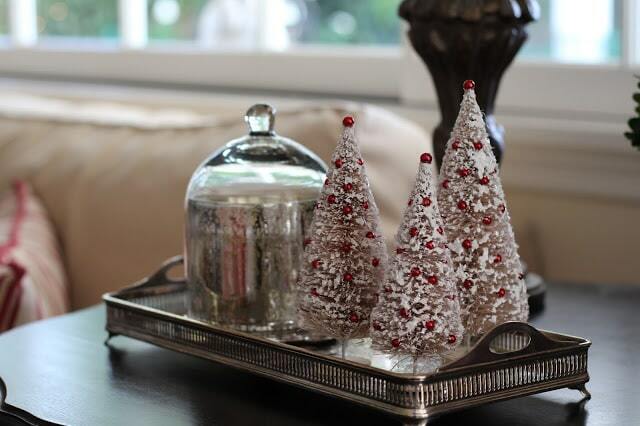 (When they were little they would argue over these little ornaments… I miss those days!) 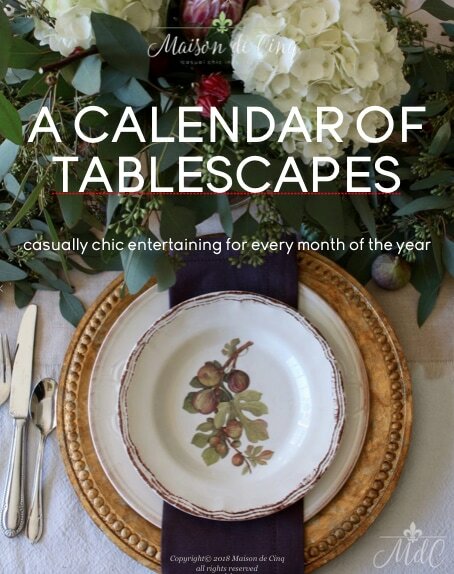 Calendar and wood signs are from Home Goods and the little snow globe is from Anthropologie. More bottle brush trees! These were actually the first ones I purchased and I bought them at a boutique a few years ago. Silver tray is an antique. In the living room we always have a large live tree, but I like to have two so I have an artificial one in this room. I miss the pine scent but I do like that I get to put it out as early as I want! Usually I have about 5 foot one but with the new puppy, I opted for a table top this year! Again, no matching ornaments, just all ones that have been gifted and collected over the years. Pillows are Pottery Barn and Home Goods. 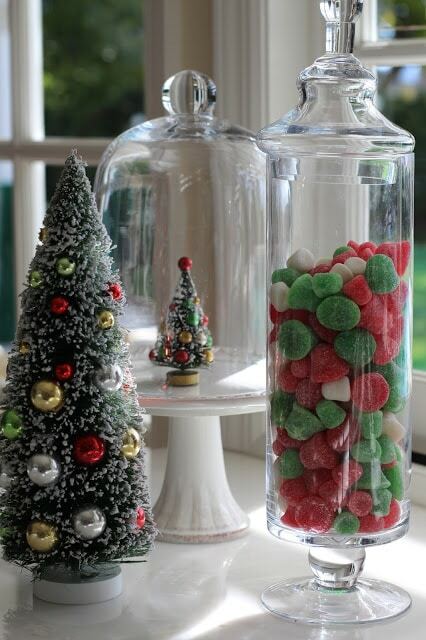 I love to fill these apothecary jars with things from each season. Candy corn at Halloween, red and white candies at Valentine’s Day, and red and green candies at Christmas. Thank you again for stopping by. Wishing you all a wonderful holiday season filled with joy and love. Also, if you missed the first half of my tour, you can click here. Thanks so much Cindy! As always, your kindness is so genuine and I appreciate it more than you know. Me too Cassie! It adds that natural element that I love so much. Thanks so much for the kind words, and for stopping by! Thank you Mimi! Not sure how I missed this comment but I will come on over and try to link up if it's not too late! I so appreciate the kindness! Sheila your house looks lovely! 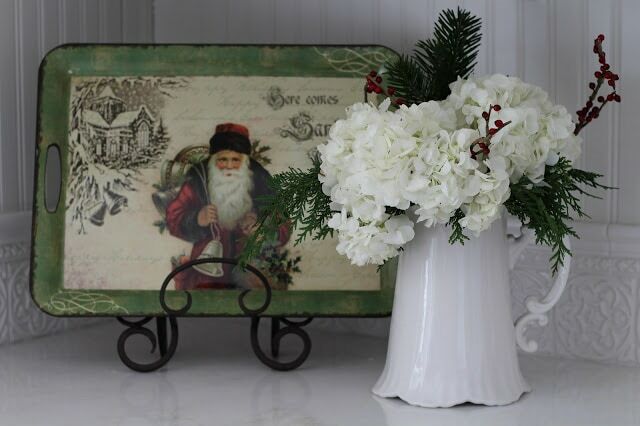 My favorite is the Santa platter with the pitcher of hydrangeas next to it…so gorgeous!! 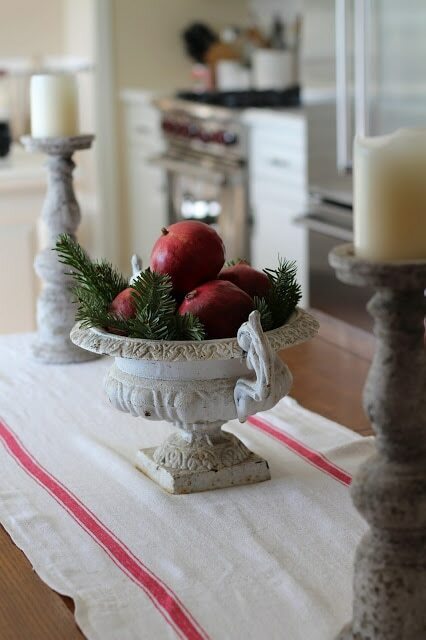 lovely- love using food as decor! 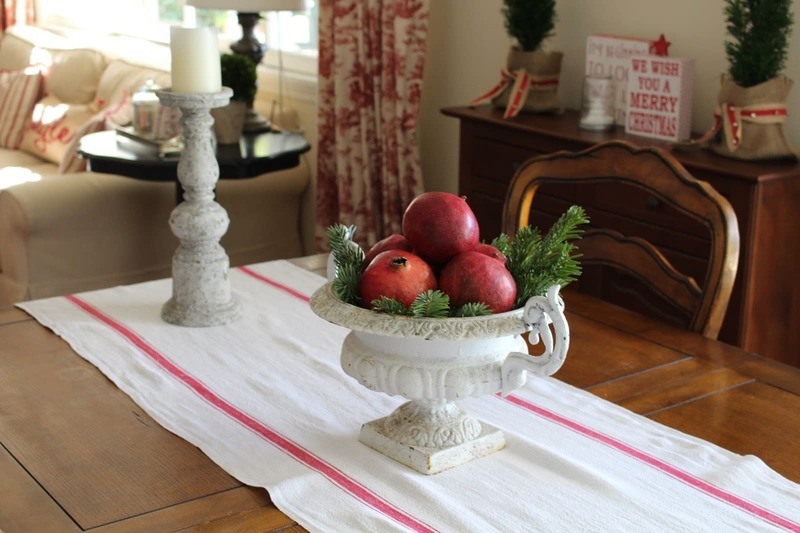 the gumdrops and pomegranates are awesome and add great color! 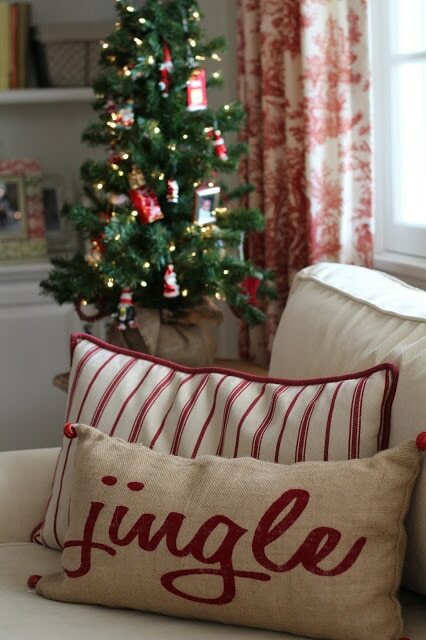 Love all your touches of holiday thru out your home! Thank you for partying at my place. So cute Sheila! Love all of your new Home Goods signs! Too bad that advent calendar isn't vintage, right! ? You know I love this room and so impressed you can still keep it so charming with a new puppy! Although that little goldern fur ball adds to the charm!!! 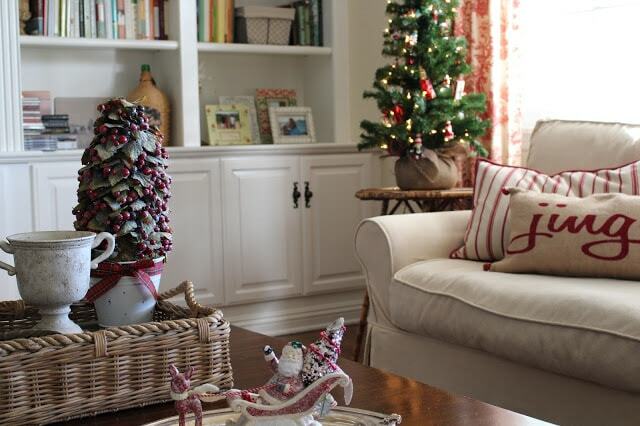 The red is just perfect in there…in fact, I may try to convince you to keep the red in your family room – sorry! There are SO many things I love…first of all, I want that vintage urn! The advent calendar is beautiful and those adorable bottle brush trees. I have a couple but after seeing your house this year, I want more! Thank you for sharing your lovely home! I love advent calendars too! 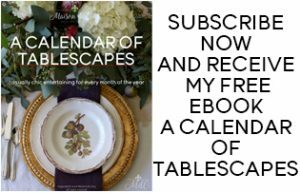 I am your newest follower on bloglovin! I absolutely LOVE the red….the advent calendar is so cute too! Everything is so cheery….I love it all!!!!!!! Merry Christmas!